blog tour. With thanks to Kate at Atlantic Books (Corvus) for involving me in the tour and for an advance copy of the book. 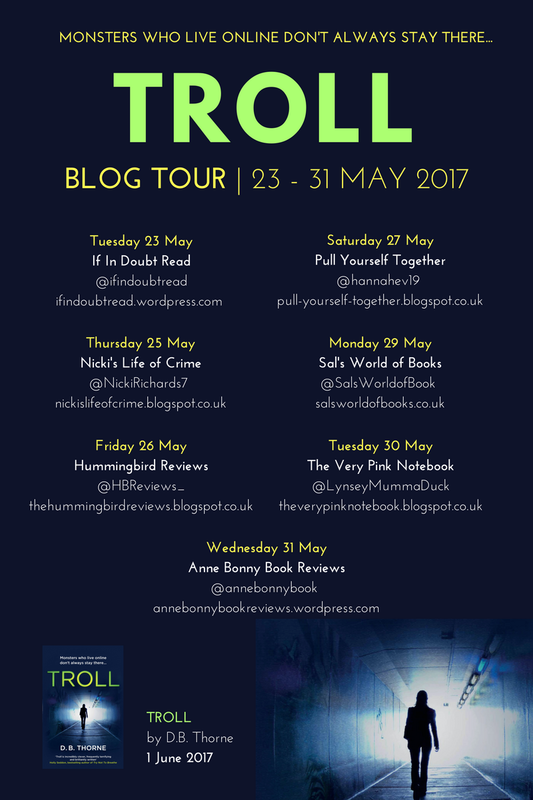 If you want a psychological thriller of epic proportions then Troll by D. B. Thorne is a must read. This novel starts unsettling and bit by bit gets darker and more twisted, but in a very real and also moving way. Told in a two-fold narrative, the story is pinned together by Fortune, a 54 year old successful businessman, but failed father and husband and Sophie, Fortune's daughter who is missing, presumed dead. It is difficult to try and review this book because I do not want to give anything away, so all I will say is the author has done an amazing job of deconstructing and reconstructing a very intricate and complicated plot in a way that will make it impossible to put down (Case in point - I read this in one day!) It is so clever and well thought out, I would love to know, from a writers perspective, how the author went about planning and plotting for this one because I am not sure I would have known where to start. I also said that although dark, this is a moving book. And it really is. It looks at the dynamics of dysfunctional families, the relationships between husband and wife, parents and children, in a deep way. 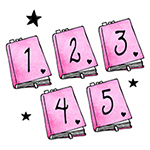 The novel tackles several difficult themes - again I won't mention specifics because I do not want to hint or reveal anything, but just to say they are handled well, so you can feel the power of them but you are not left with a stomach turned. Again, this is done through excellent writing by D. B. Thorne. With it's clear and clever structure, flawless writing, strong characters and excellent use of locations this is definitely one of the best psychological thrillers I have read this year and I will certainly be making a point of picking up the other books by this author. D. B. Thorne has worked as a writer for the last 15 years, originally in advertising, then in television and radio comedy. He has written material for many comedians, including Jimmy Carr, Alan Carr, David Mitchell and Bob Mortimer. He was a major contributor to the BAFTA-winning Armstrong and Miller Show, and has worked on shows including Facejacker, Harry and Paul and Alan Carr : Chatty Man. 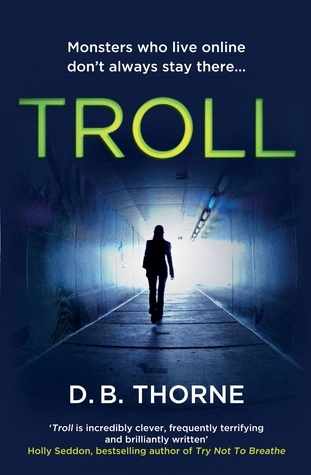 Troll is his fourth novel.